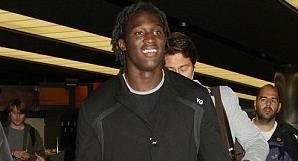 Looking extremely happy, Romelu Lukaku arrived by Eurostar this morning to put the finishing touches to a £18m move to Stamford Bridge. Lukaku was planning to fly in to Heathrow before making the short transfer to Chelsea's Cobham training ground for the formalities of undergoing a medical and putting his name to a five-year contract. Instead, he opted for rail as his preferred method of transport, drawing quizzical looks from early-morning commuters, as he boarded the Eurostar from Brussels along with his agent Christophe Henrotay. Arriving at St Pancras just under two hours later, the pair were met by a Chelsea official for a chauffeur-driven ride to Cobham, where the 18-year old was due to have a medical and sign his long-term deal. Following his medical, Lukaku will link up with the Belgium squad on Tuesday for their friendly in Slovenia the following night before being officially unveiled by the Blues later in the week.